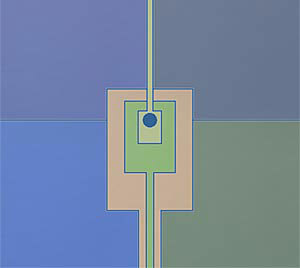 (Nanowerk News) Physicists at the National Institute of Standards and Technology (NIST) have demonstrated an ion trap with a built-in optical fiber that collects light emitted by single ions (electrically charged atoms), allowing quantum information stored in the ions to be measured. The advance could simplify quantum computer design and serve as a step toward swapping information between matter and light in future quantum networks. Described in a forthcoming issue of Physical Review Letters ("Efficient Fiber Optic Detection of Trapped Ion Fluorescence"), the new device is a 1-millimeter-square ion trap with a built-in optical fiber. The authors use ions as quantum bits (qubits) to store information in experimental quantum computing, which may someday solve certain problems that are intractable today. An ion can be adjustably positioned 80 to 100 micrometers from an optical fiber, which detects the ion's fluorescence signals indicating the qubit's information content.